Art Matters: Why Me as Your Guide? Why Me as Your Guide? My mother used to tell me I loved to draw from the time I could hold a crayon. 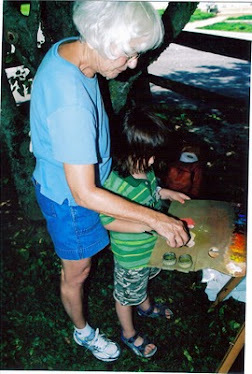 When I pleaded with her to help me learn to paint, she found a neighbor who gave lessons on her kitchen table. From 8 years old until I could travel the subways on my own at 12, I went to her apartment once a week after school and learned how to make pictures with oils. The lessons involved copying calendar photos, circus posters, or landscapes in magazines. At 12, I traveled to the loft of a “professional artist” somewhere in the West 70s. 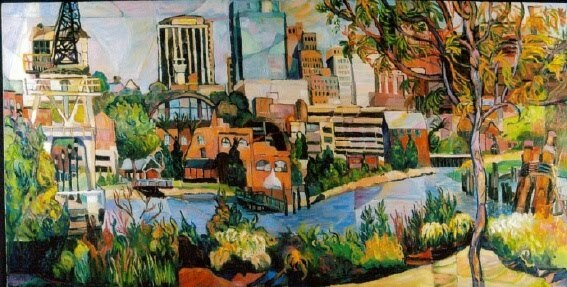 He continued my training and perfected my ability to make “realistic” paintings my parents loved. If I visited the New York City museums at all, I found the work in them, if not a mystery, at least food for silliness. At the Museum of Modern Art, for instance, my best friend and I would try to figure out how the titles fit the picture. For example, for Yves Tanguy’s, Mama, Papa is Wounded!, we decided Papa was the right- tilted, vertical projection on the right because it looked hairy and Papa needed a shave. Mama, we decided, had to be the small, green, headless thing in the far left shouting at him to shave because his stubble made her face sore. Papa felt wounded because Mama’s criticism hurt his feelings. Yves Tanguy, Mama, Papa is Wounded! When I went to college, I took the required art history course, and I generally fell asleep when the lights went out and the images flashed on the screen. 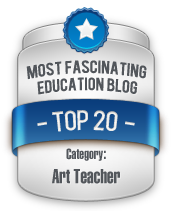 I majored in English, not art or art history, and earned a MA degree from the Pennsylvania State University. After a year of teaching, I traveled through Europe and saw the sights. I visited the Louvre and found the Mona Lisa. There it was, encased in bullet-proof glass, smaller than I expected, and surrounded by hordes of people. Tour guides, speaking numerous languages, told us about it. From them, I learned: Leonardo da Vinci was a genius of the renaissance period. His skills were legendary - painter, architect, engineer, mathematician and philosopher. The name of the subject was believed to be Mona Lisa del Gioconda. She was the wife of Francesco di Bartolommeo di Zanobi del Giocondo. She was believed to be 24 years old at the time her portrait was painted. Her enigmatic smile has captured the imagination of people for centuries. I also learned: Da Vinci started to work on this painting in 1503; He spent four years on the portrait; It is painted on 77 x 53 cm poplar wood; He never sold the portrait; Some believe the portrait of the Mona Lisa is in fact Leonardo's female version of himself; On August 22, 1911, the Mona Lisa was stolen but soon recovered; In 1956, an acid attempt damaged the lower half of the painting and the restoration took several years. I did not care about any of this, and I could have saved a lot of money and time by staying home and looking up all these “facts” in any book (in 1963, we did not have the Internet, where I currently found all the above “facts” listed). I wanted to know why it was a work of art. I wanted to know why I had traveled so far so see it. I wanted to look at it and understand it. 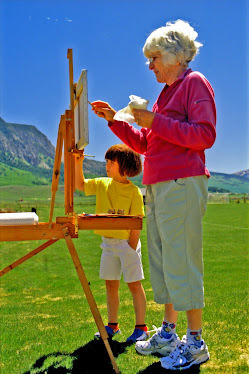 As you can tell, even though I loved to paint, art, what it was about, what it meant, what I could learn from it, baffled me. If I had not stumbled into a painting class, many years later, at the Delaware Art Museum taught by Wilmington artist Edward L. Loper, Sr., I might never have changed my mind that looking at art did not seem to be worth the effort. Ed Loper not only engaged me in a visual adventure, teaching me a new way of seeing that changed the way I made my pictures, he insisted I study at the Barnes Foundation. He had preceded me there by 10 years, and he told me Miss de Mazia would “sharpen me up.” Never one to mince words, he essentially told me I knew nothing about art. I studied at the Barnes Foundation for 10 years, first in Miss de Mazia’s class, then in Angelo Pinto’s, and then for 8 more years in de Mazia’s seminar. Since then, making pictures, teaching art appreciation, and writing about art fill my life. If you wish to see my paintings, go to http://www.baumanfineart.com/. You will find a more detailed and thorough biography on that website. In my book, Edward L. Loper, Sr.: The Prophet of Color, I tell the story of Ed Loper’s life and work as well as the influence he has had on me. My next post, "Why Look at Art?," starts the process. My curiosity is roused. I will eagerly anticipate learning why I should look at art. Me, too. I'm curious what all the art fuss is about. Marilyn, about your assignment, I need some clarification please. Question 1. "looking at the back of the gallery" Do you mean the back of the "building/museum"; as we are coming from the parking lot? Next regarding the notes from our first class; under "Important Information". Could you please give the page and author - de Mazia or Barnes of the terms you want us to be familar with. The reading is so dense as you said and this will help become more accustomed with their writing styles and find the information less stressfully. Can't wait to read what is next! Glad you are joining the conversation, Victoria.